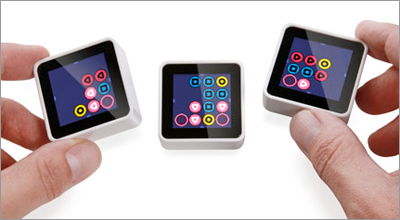 Sifteo Cubes are tiny tangible screens with a built in accelerometer and touch button. Each individual device is a terminal that communicates with the processor in the included Basestation over a small radio link. Writing applications for this environment is akin to writing games for an old school video game system. You mainly work with pre-rendered images (ie backgrounds and sprites) and use specialized video modes and sprite handling. There is a mode for custom drawing, but the system is not optimized with accelerated graphics, so don’t plan on using lots of procedural drawing as in Processing or OpenFrameworks. You program from the point of view of the Basestation and specify how many cubes can be handled in your app. You then allocate a video buffer for each cube which may or may not be used if you have enough cubes connected. For more detail, checkout the Sifteo SDK Graphics Engine page. Create a Developer account on the Sifteo site. Download the Sifteo SDK for your platform, and be sure to review their documentation. They have a Getting Started guide which you may find helpful. There a number of example apps in the examples folder. We recommend working from their Sensor Template App for interaction. To load your creation onto actual physical blocks, you will need to carefully read the Device Management SDK page.